Durham Attack 13U Heat embraces team spirit during Waterloo Tigers 14U Invitational Tournament. 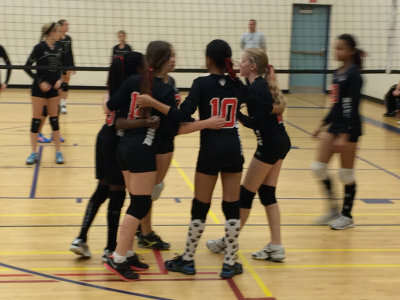 This past weekend Durham Attack 13U Red ‘Heat’ competed in the Waterloo Tigers 14U Invitational tournament at Jacob Hespeler Secondary School in Cambridge. During this 16-team event the girls showed wonderful team spirit, coming together on the court, encouraging each other after each play. Overall they had a fantastic day and played great! A few highlights were winning two of their games against 14U teams, then ending the day winning their last game against Durham Attack 13U Black ‘Chaos’. Way to go girls! Special thanks go out to the Waterloo Tigers for putting on a well-organized, fun opportunity for competitive volleyball; the coaches & managers for their dedication and enthusiasm; and to the parents that organized a delicious spread of food that was enjoyed by all. Thanks Vanessa! We all appreciate your updates. I am very proud of our HEAT Athletes, Coaching Staff and Community of Support.